It has been tough to get very motivated to get out and shoot lately with the weather. Austin winters are cloudy, drizzly, and gray most of the time. The cool temperatures are nice, but trying to get out and shoot landscape photography is not always easy. I made myself get out with the camera last night and try something. There is an idea I have for an Austin shot that I have not been able to pull off yet. It involves downtown against a sunset. Looking at the forecast yesterday and observing the sky from work, it seemed like there would be a good chance at a nice sunset. So I went to a parking garage that I have tried before to experiment with this idea. First of all, the sunset was a dud. A ridge of thick clouds piled up on the western horizon and we got almost no color. But I was there so I tried to make the best of things. 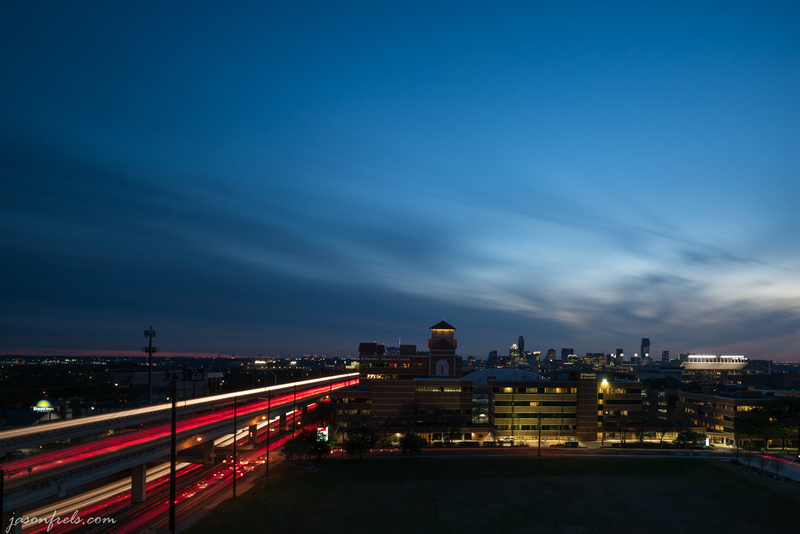 This parking garage overlooks Interstate 35, which is double-decked in this part of Austin. So, I did a long exposure to get some trailing car lights. This was a 2 minute exposure using a 10-stop ND filter. As you can see, the sky is gray and blue. Another thing that I don’t love about this location is the UT football stadium is between this point and downtown and I don’t want it in my shot as it is too distracting. So, I have another garage in mind near a hospital that I will try on a strategic evening. My concept called for using a long lens to get in and put the skyline against a nice sunset. The image below is the closest I got to any color in the clouds. There is a very slight orange tinge. The football stadium lights are in the way as is the hospital directly in front of me. 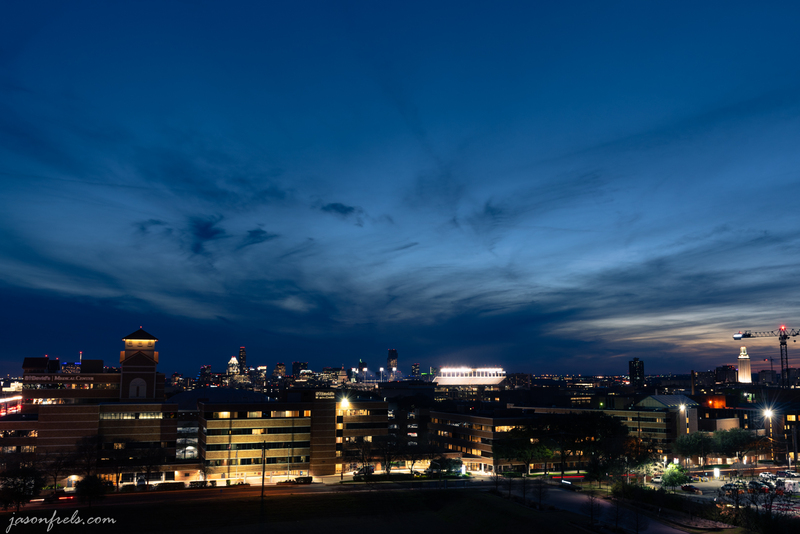 This image was a bit of a crop and I was unable to get all of the skyline that I wanted because of my view blocked by other objects. Below is my parting shot as the sky went blue. This was a photo that I took because I was there. The clouds were interesting if not colorful. There is a little color on the western horizon (this image is mostly facing south). Well, I will keep trying. My next attempt will be at a different location where I haven’t shot before. It is a bit farther east but about as far from downtown as this place. I think that it is at a higher elevation though and it does not overlook the university and those construction cranes to the left. On the way down stairs, I noticed the upper and lower decks of the interstate framed through the concrete of the parking structure and took a few phone photos. 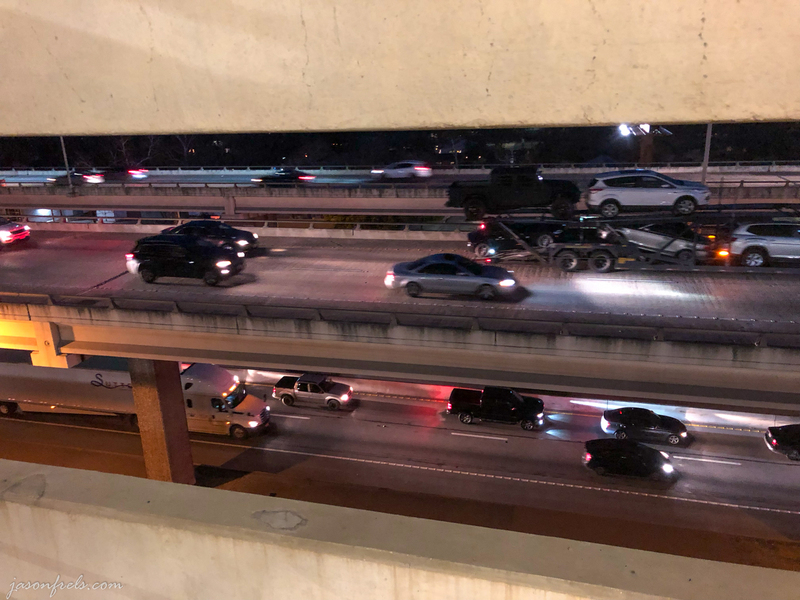 In this part of Austin, the interstate highway splits into upper and lower decks and I thought that this looked interesting from this vantage point; kind of an abstract shot. And this is the traffic that I got to drive home in. It is gray and overcast as I write this, but it is supposed to be clear this weekend. Those sunsets are elusive. 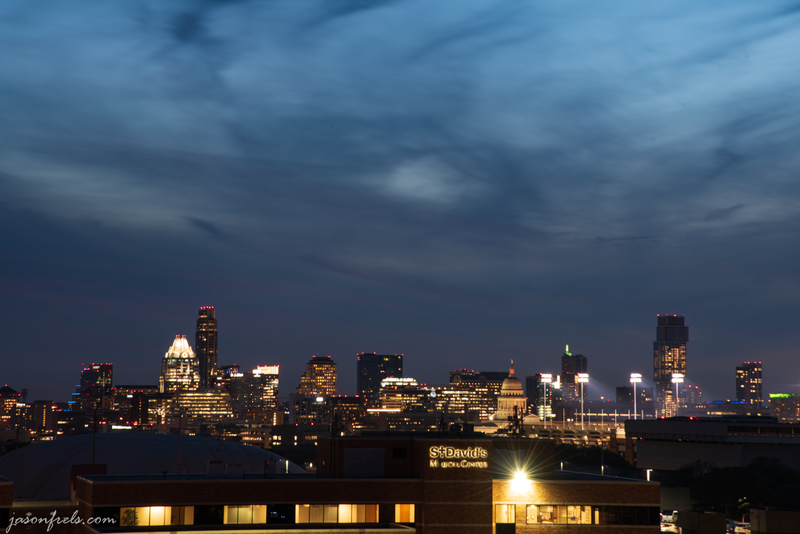 The Austin skyline is mesmerizing!